Venting "Pure Love" into the air, the Entranced Love Bot was designed to spread pure pheromone-L from his vents to make sure that every hunter feels like they're in love! The Entranced LoveBot Skin can be used on Enraged RhinoBot. The trap's stats (power, power bonus, attraction bonus, etc.) are not changed. The Entranced LoveBot Skin may be made available during the annual Valentine's Day event and can be traded on the Marketplace or through Give To Friends. 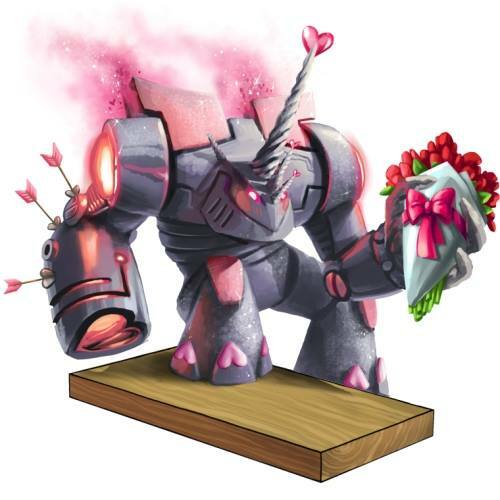 30 January 2014: The Entranced Love Bot Skin was released at the start of the Year of the Horse Festival event, then renamed to Entranced LoveBot Skin on 8 February for consistency. This page was last edited on 9 December 2017, at 11:28.